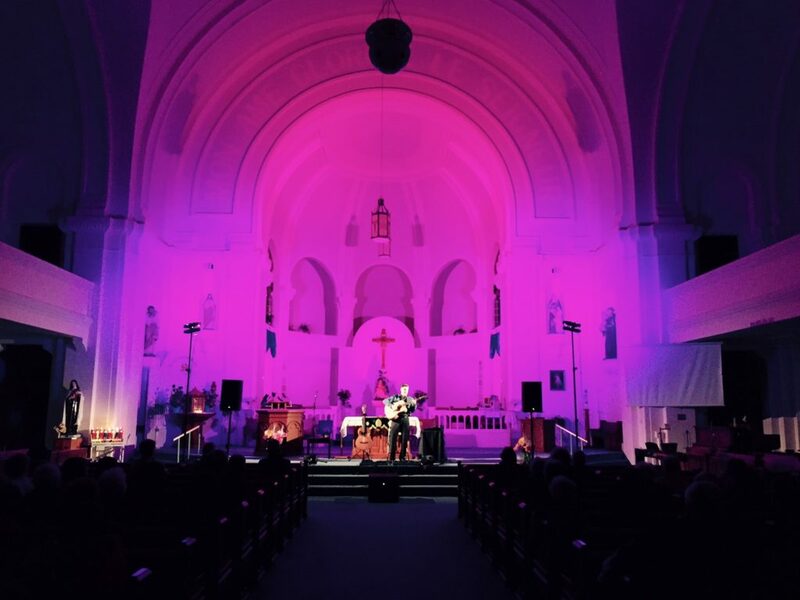 Mark’s testimony continues… You can read Parts I – III here: My Testimony. HOST and producer of my own television show; an executive office, company vehicle, and great co-workers. It was the perfect job. But standing at my office window one summer afternoon, overlooking a cow pasture on the edge of the city, I felt a twinge of restlessness. Music was at the core of my soul. I was the grandson of a Big Band crooner. Grampa could sing and play the trumpet like nobody’s business. When I was six, he gave me a harmonica. When I was nine, I wrote my first tune. At fifteen, I penned a song I used to sing with my sister that, after her death in a car accident four years later, became “her” ballad (listen to Too Close to My Heart below). And of course, through my years with One Voice, I had piled up dozens of songs that I was itching to record. So when I was invited to a do a concert, I couldn’t resist. “I’ll just sing mostly my love songs,” I told myself. My wife booked a small tour, and off I went. “Oh. Well, that’s good. I’m glad…” I responded. But I resolved, nonetheless, to stick to the music. The next two nights, the exact same thing replayed. And once again, people came to me afterward saying that it was the spoken word that ministered to them most. I returned home to my job, a little confused—and even more restless. “What is wrong with me?”, I wondered. “You’ve got a terrific job.” But the music burned in my soul… and so too did God’s Word. A few months later, unexpected news filtered up to my desk. “They’re cutting the show,” said my co-worker. “What?! Our ratings are climbing!” My boss confirmed it with a rather benign explanation. In the back of my mind, I wondered if it wasn’t because of the letter to the editor of a local paper I had sent just weeks before. In it, I questioned why the news media was eager to publish pictures of war or fender benders… but then avoided the photos that told the true story of abortion. The blowback was fierce from fellow workers. The news boss, a practicing Catholic, scolded me. And now, I was out of a job. Suddenly, I found myself with nothing to do but my music. “Well,” I said to my wife, “we made nearly almost as much from those concerts as my monthly salary. Perhaps we can make it work.” But I laughed to myself. 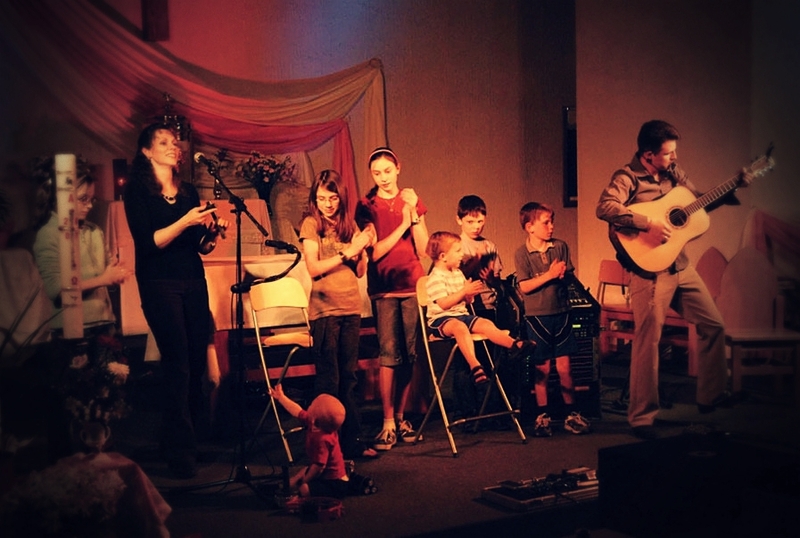 Full-time ministry in the Catholic Church with five kids (we now have eight)?? We’re going to starve! With that, my wife and I moved to a small town. I built a studio in the house and began my second recording. 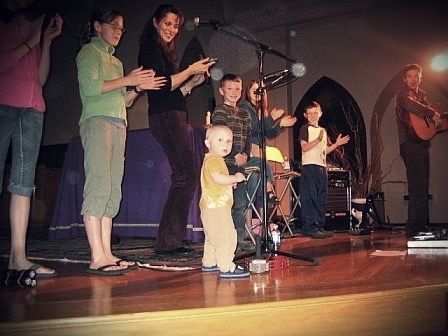 On the night we finished the album over a year later, we set off on our first family concert tour (at the end of each evening, our children would come up and sing the last song with us). And like before, the Lord continued to put words on my heart that burned until I spoke them. Then I began to understand. Ministry is not what I have to give, but what God wants to give. It’s not what I have to say, but what the Lord has to say. For my part, I must decrease so that He may increase. I found a spiritual director Fr. Robert “Bob” Johnson of Madonna House and under his guidance began, cautiously and somewhat terrifyingly, a full-time ministry. We eventually bought a large motorhome, and with our children, began to tour through Canada and the United States living on God’s Providence and whatever music we could sell. But God was not done humbling me. He’d only just begun. My wife had booked a concert tour in Saskatchewan, Canada. The kids were now being homeschooled, my wife was busy with designing our new website and album cover, and so I would go alone. By now, we had begun recording my Rosary CD. We were working long hours, sometimes getting only 4-5 hours sleep each night. We were exhausted and feeling the discouragement of ministry in the Catholic Church: small crowds, poor promotion, and a lot of apathy. Mark, never underestimate the value of one soul. Never underestimate the value of one soul. I cried the entire trip home. From that moment on, I resisted counting crowds or judging faces. In fact, when I show up to events today and see tiny crowds, I rejoice inside because I know that there is one soul there whom Jesus wants to touch. How many people, who God wants to speak to, how He wants to speak… it’s none of my business. He has not called me to be successful, but faithful. It’s not about me, or building a ministry, franchise, or renown. It’s about souls. You are bringing the light of the Lord to the world to replace the darkness. —H.L. You have been a compass to me through these years; among those these days who claim to hear God, I have come to trust your voice more than any other. It keeps me on the narrow path, in the Church, walking with Mary to Jesus. It gives me hope and peace in the storm. —L.L. Your ministry means so much to me. Sometimes I think I should be printing these writings out so I always have them. I truly believe your ministry is saving my soul… —E.H. …you have been a constant source of God’s word in my life. My prayer life is so alive right now and many times your writings echo what God is speaking to my heart. —J.D. We continue to fundraise for our ministry this week. with your prayers and donations. Posted in HOME, MY TESTIMONY.